Anyone out there tried one of these for fixed XC-type riding? Seems logical, easier to change gears than a track cog, and cheaper given that I have lots of SS cogs hanging around. I'm sure you could email the guys at WC and ask them? Dave you going to become rude and dangerous with the fixie now? it's a trials hub. 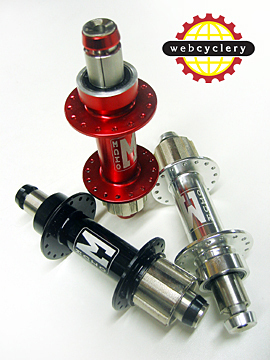 for the kind of drivetrain with the freewheel at the cranks. getting cogs can be an issue. 4 bearings is nice. not disc compatable is a bummer. Using that kind of trials hub for fixed usage doesn't work out too good. There is inherently a little play front-to-back between the cog and the splines (even with the tightest fitting stainless King Cog). Give it a couple hundred miles, and the cog has enough play to notice at the pedals...and it wears on the drive shell something fierce. It can also loosen up the cassette lockring eventually. So...yeah...sorry to burst your bubble. I suppose that if you had a cog had an interference fit with the splines, it wouldn't move, but I don't know anyone that makes one. Give it a couple hundred miles, and the cog has enough play to notice at the pedals...and it wears on the drive shell something fierce. Ahhh, that does make sense. Proven technology is exactly that. Dave, you know it! I've wanted a fixie for ages. Cogs are easy for the 6-sp fixed hub he pictured. Plain o' Shimano splines. Great idea if you ask me. I've heard the bearings are none too great, but that you can replace them with good ones if you want. my problem with the level is the thee bolts holding the cog on seem to come loose everyonce in a while. but i am using grease not locktite so maybe that is my problem. i am excited to get a disc bolt on cog up and running! i think 6 bolts are hopefully enough to keep a fixed cog in place. I think the Level concept is great, and they look very classy in person with the enormous flanges. For practicality, I reckon I'll be getting a good ole Surly flip-flop. if the freehub is steel and a large bolt holds the freehub in place, theres a good chance it will work. The hub is made to prevent the cog from diggin in under forward acceleration, it should do the same for rearward accleration. I have a welded freehub fixed wheel and the locking and knurled cog from a cassette hold the cog in place well. I also coupled the cog to a couple spacers using the rods from the cassette for a large interface on the freehub body. If there is play in the cog under load, I don't notice it due to the play in the chain. Huh, I never knew there was such a drivetrain. What's the purpose of that, more pawls can fit for better engagement? It basically allows you to run a multi-speed drivetrain, but with the cheapness/reliability of a single speed freewheel. It only really applies to trials, however, because of the limited size of freewheels available. A) King or Hope rear freehubs with a thread-on track cog on the cranks. The only way to get multiple speeds is for is option A ($$) or to use a front freewheel with one of the hubs in question. Using a "SS Freehub" in the back only gives you one gear. ive got a few fixie set ups around let me know. Thanks Dan, just ordered a Surly/Open Pro wheel from Ed. I'll have 35c cross tires, and intend to go play at Granite Basin when it's built. cool.if you have any questions let me know ive logged a few fixie miles. what about the miche cogs? they use a carrier that threads on like a standard fixed gear, but the cogs slide on like a cassette. the only real problem is the lack of availability of big cogs for climbing.